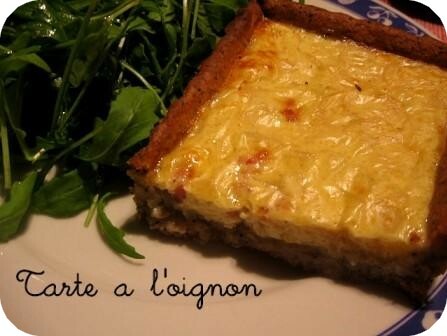 Onion Tart may be my favorite Alsatian recipe. 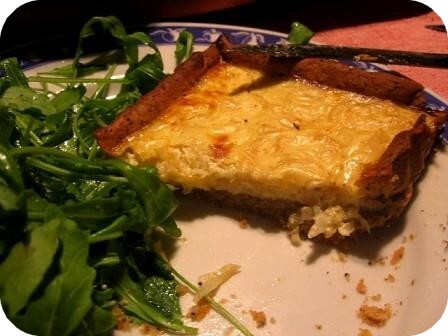 A bunch of thinly sliced and caramelised onions, poured along with a mixture of eggs and cream into a pastry shell. You can use different kinds of pastry to bake this tart: shortcrust pastry, puff pastry or, even better, bread dough. You can add bacon or gruyère cheese on top if you fancy. I prefer onion tart sold by the slice at the baker’s, made with bread dough. But for a quick dinner fix, feel free to use any kind of pastry you want. This is a lighter and healthier take on the traditional recipe, with a shortcrust pastry made using whole wheat flour and olive oil. In the bowl of a food processor, combine flour, salt and poppyseeds. Add olive oil and process until the mixture resembles coarse meal, 8 to 10 seconds. Then add the water and pulse until you get a soft and elastic dough. Shape the dough in a ball, cover in plastic wrap and place in the refrigerator for 30 minutes. Preheat oven to 160°C. When the dough has chilled, roll out the pastry and line your tart shell with it. Cook the pastry in the oven for 20 minutes. Meanwhile, slice the onions as thinly as you can. Heat the olive oil in a large skillet over medium heat and cook the onions. Don’t let them get some colour. Add water and white wine, and let the onions simmer gently. They are ready when they are soft and all the liquid has absorbed. Beat the egg in a small bowl, add the cream, salt and pepper. Beat well with a fork. Add in the onions and mix well. Fill the pastry shell with the onion and cream mixture. Bake for 30 minutes. Serve with some green leaves (aragula for us) and a glass of white wine (Riesling would be the best, I think). Bacon on top or not?